Over the past 20 years, new treatment options have made our patients’ orthodontic experience more efficient, but not necessarily faster. That is, until now! We are very excited to offer several clinically proven techniques to reduce orthodontic treatment time to fewer visits while making sure we still deliver great results. This state-of-the-art technology allows the teeth to move faster and more predictably into their ideal position, and though every patient’s situation is different, many can now have their orthodontic treatment completed in less than a year. PROPEL can be used for approximately 80% of patients who receive orthodontic treatment, and can be used in conjunction with any treatment type, including TADs, clear aligners, clear braces, and conventional metal braces. To learn more, contact our office! Dr. Henao is very proud to carry the Propel VPro5. This revolutionary tool to increase the speed of your orthodontic treatment is simple to use and takes only five minutes out of your day. 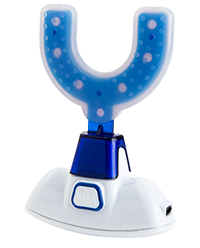 VPro5 delivers a series of micropulses to accelerate tooth movement alongside your orthodontic care.